Pineapple in zucchini bread? YES! Zucchini Pineapple Bread makes a moist, delicious quick bread loaf for breakfast, a party tray or snacks. The fresh or canned pineapple adds a little bump of flavor to this delicious quick bread recipe. 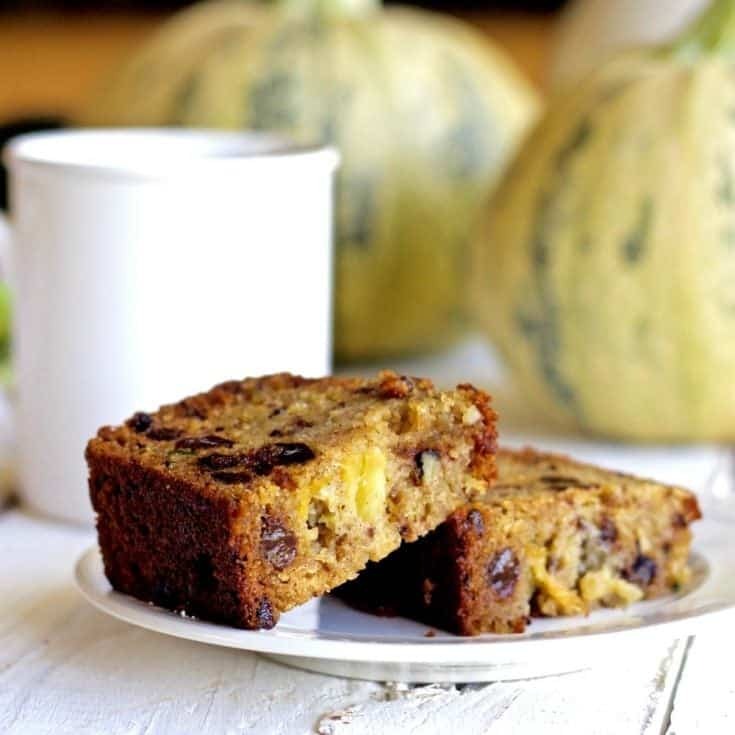 Zucchini Pineapple Bread is full of flavor bursts. The raisins and pineapple are marvelous together! Notice the zucchini in the background of this picture. Those round squash are Zucchini too! This is our first year growing round zucchini. They are really cute! Our zucchini plants in our garden are overwhelming us this year. Not a shocking problem with this prolific vegetable. New zucchini emerge every day out of our garden. They line my kitchen counters in August. I freeze zucchini raw, or baked as a bread, cake or casserole. We love zucchini in lots of different ways. Click here for more amazing zucchini recipes.This wonderful vegetable has so many uses! I feel like a squirrel storing up for winter. I pleaded with Dave to plant our zucchini hill knowing full well I’d never keep up with it. My family is used to me zucchini bombing them this time of year. 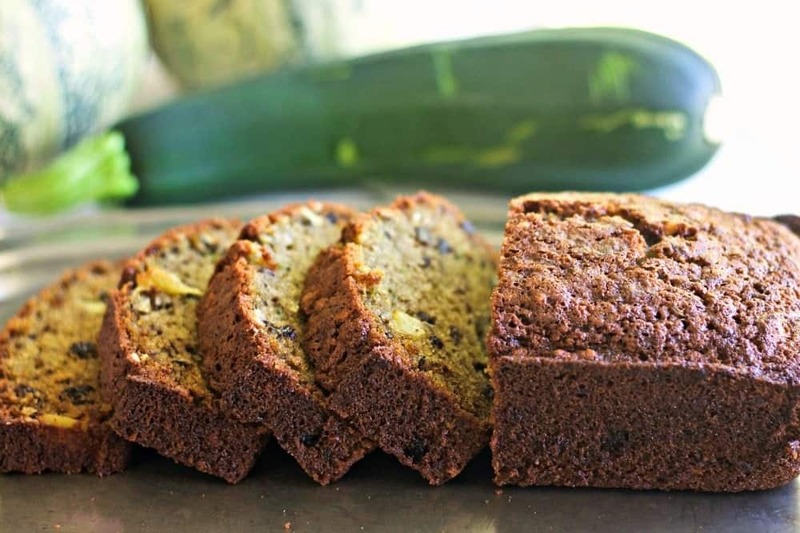 🙂 Since my first taste of Grandma Cash’s Chocolate Zucchini bread (or cake) , as a child, I was hooked on zucchini! 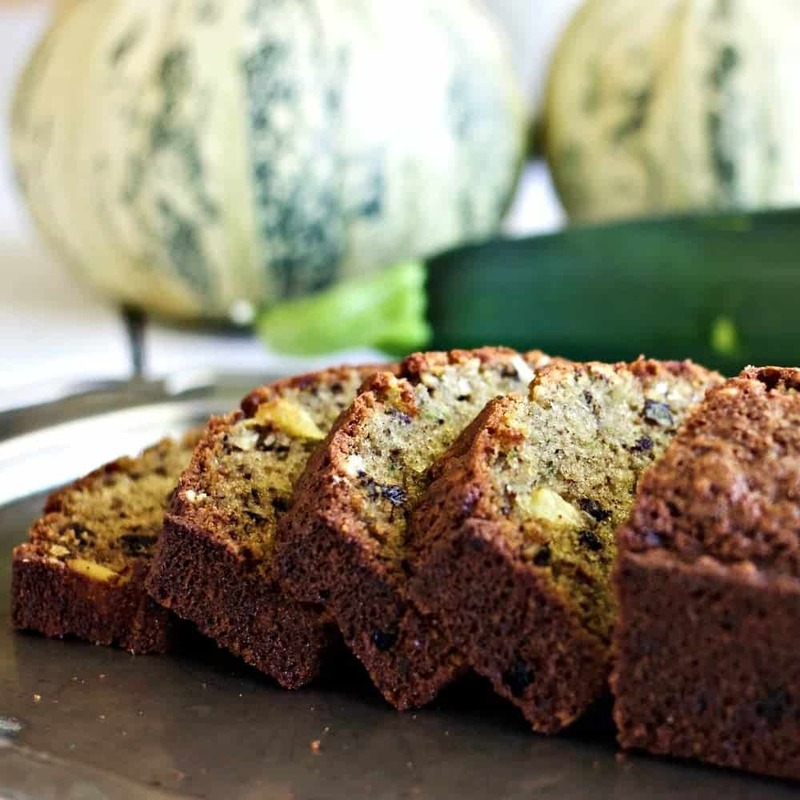 I bake lovely fragrant zucchini loafs (and many other zucchini recipes) every harvest season. Mom stopped by today. She fell in love with this bread after the first bite. I whipped out my camera, took a few pics for this blog post, and then wrapped up a loaf for her. She is taking it camping next week to share with her RV group. 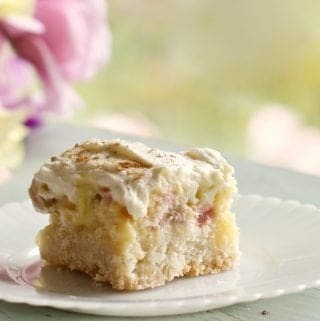 A fragrant, delicious easy to make dessert! This easy dessert is wildly popular everywhere it goes! Take it to Tailgate parties, potlucks, or any group occasion. NOTE: You CAN Use fresh Pineapple in this recipe. I have made this recipe with both fresh pineapple and canned. It will work either way. Cut the ends off the pineapple and the skin. Cut the pineapple from top to bottom in half and then half again. Now cut out the thick hard inner core. This leaves you with the tender outer flesh. Cut this outer ring of pineapple flesh into cubes. You will only need 1 cup of cubed pineapple. You can also use shredded FROZEN ZUCCHINI in the off season. Thaw and Drain your shredded frozen zucchini ahead of time. Ignore the instructions to PREP the zucchini. Just lightly squeeze out the water after it’s drained and use as if it’s fresh. We love pineapple. 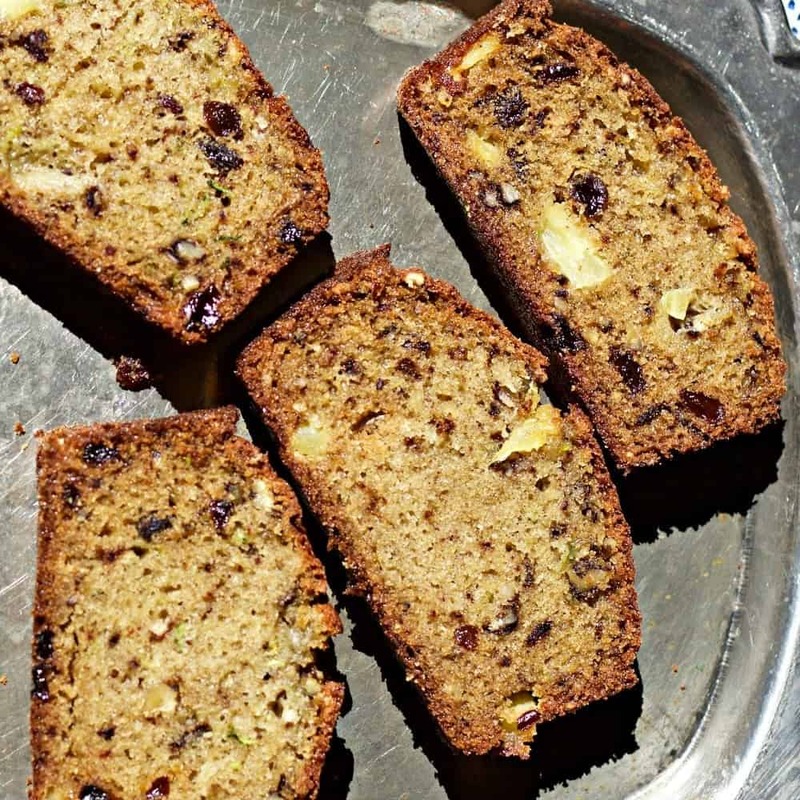 It is a delightful combination with the zucchini, raisins, and nuts. The walnuts add lovely texture to this bread. Coconut oil is a healthy fat that significantly improves the flavor of most baked goods, in my opinion. Replacing the butter with coconut oil makes this loaf dairy free! Another oil that works beautifully in this recipe is Avocado oil. I was worried the flavor would be affected but it’s not! 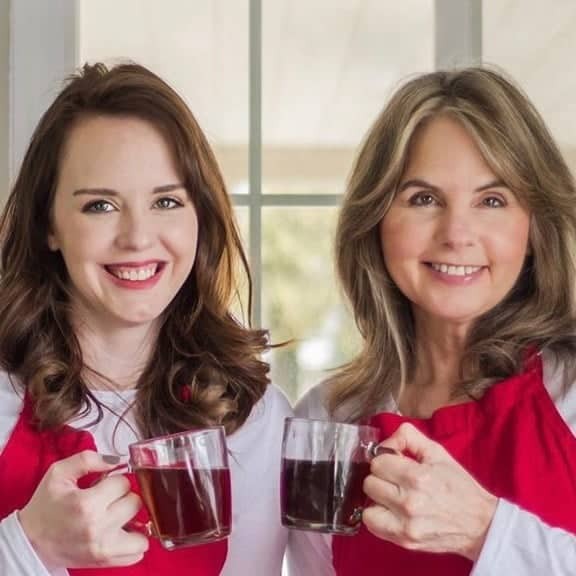 And what a great heart healthy oil. TIP: My niece Meghan taught me this in her excellent Blueberry Zucchini bread recipe . It’s A flavor trick that benefits all the zucchini bread recipes I have used it in. Reduce the vanilla by 1/2 tsp. add in 1/2 tsp of almond extract. It’s magic! Zucchini Pineapple Bread makes a moist, delicious quick bread loaf for breakfast, a party tray or snacks. 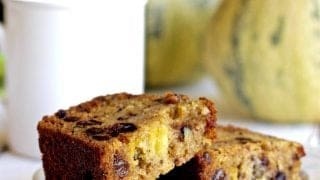 The fresh or canned pineapple adds a little bump of flavor to this delicious quick bread recipe. Prep the zucchini by adding 1 tsp. sugar and tossing it together with the shredded zucchini in a bowl. After 20 minutes strain the zucchini and gently squeeze out some of the liquid. Set aside. Stir zucchini and pineapple into the egg mixture with a large wooden spoon. In a separate bowl, combine flour, baking soda, baking powder, salt, cinnamon, and nutmeg. A third at a time, fold in the walnuts and raisins.Stir together. Divide the batter evenly into your oiled 5x9 baking pans. Bake for 1 hour or until a toothpick inserted into the middle come out clean. Cool in pans for 10 minutes. Turn out onto wire racks to completely cool. Prep the zucchini by placing on a plate with 1 tsp. salt for 20 minutes and then squeezing it until the excess water is removed. The recipe calls for the squeezed quantity. Don't bother with this step if you're using later season zucchini that is already pretty dry. If you are using a dry zucchini shred it fine to more easily incorporate it into your loaf. 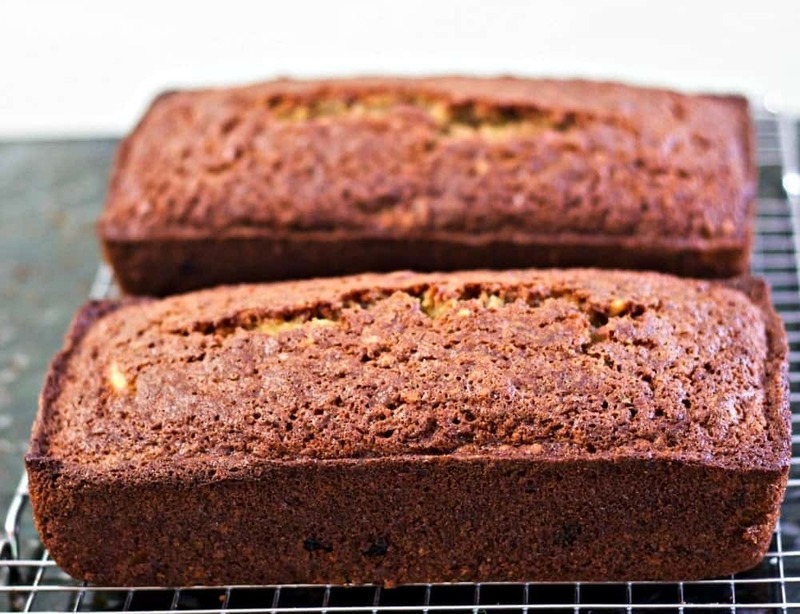 Are the Zucchini bread baked in two 9×5 baking loaf pans? This recipe needs two bread pans 9 x 4. Use 1 Cup fresh pineapple cut into small cubes. Thanks for asking. Love to know how it turns out for you! I would like to know if I can use Canaoil? I want to use fresh pineapple. How much do I use? You can use canola oil if you prefer it to coconut oil. It will make a difference in the flavor but the bread will turn out fine. I loved it. Was fabulous. My grandchildren ate it all. Hi Sandra, This is one of our favorites too. I’m delighted your family liked it. I really appreciate you coming back to review the recipe for us. Thank you and have a great day! Have you ever used an egg replacer (flax or chia egg)? Would almond flour work in place of the all purpose? This is a REALLY good bread. I hope you give it a try. Replacing the eggs with flax meal should work ok. I have used flax as an egg replacer before and it works great. But I have never tried it in this recipe. The Almond flour is another thing. That is a BIG change. I’m not familiar with almond flour so I cannot offer you much help with it. I have looked up other recipes using almond flour and the problem is the recipes tend to get soggy. One suggestion is to add a few tablespoons of coconut flour in to help absorb the liquid. Also, be sure to prep the zucchini as described in the recipe. That also helps reduce extra moisture. Good luck and please let me know if you attempt it and how it comes out. I’m sure we have other vegan readers that would benefit from your experience. Have a great day! Hi JP, Thank you for asking about the recipe. I have reviewed the recipe. I recently made this recipe so I can tell you it is correct as written. Zucchini bread does use more oil than other types. I’d love to know how it turns out for you. This is a huge favorite with our family. Thank you for your prompt reply Diane! 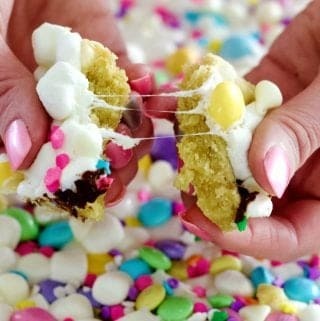 I will be making it this weekend and can’t wait! I will surely let you know how it turned out. Thank you again! Sooooooooooo, I made this on Saturday morning and I have to say this: …it is such an easy recipe and the outcome was……….AMAZING!!! Flavorful, with just the right amount of the ingredients so that none of them overpower any others…..all that, yet you can taste everything! DELICIOUS! It was so good, my wife and I couldn’t stop eating it! (which was not good because now I had to make more for the church social on Sunday…..which turned out to be a good thing! The first comment I heard about the bread was from a woman who exclaimed (rather loudly) “sell my clothes…I’m now in Heaven!….JP, this bread is delicious!” More comments came after that and folks were asking for the recipe. I emailed them your link to the recipe, so expect more traffic on your site! 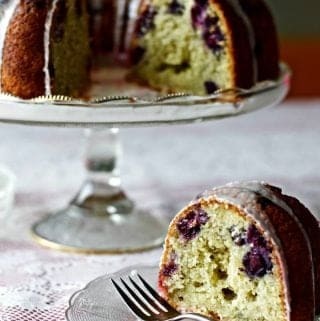 Dianne, THANK YOU very much for sharing your recipes, skills and knowledge with everyone! 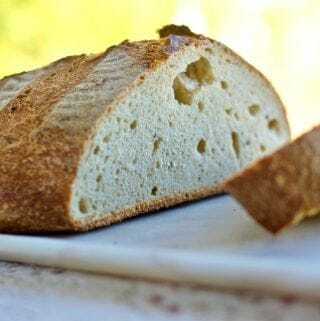 This is the BEST bread recipe I have ever tried and it will be a big part of our lives to come! JP THANK YOU! I appreciate your feedback more than I can say. I’m thrilled, excited and delighted you, your friends and family love Pineapple Zucchini Bread as much as we do. This has been a faithful recipe for me too. Always a winner. You are so kind to take the time to come back and give this wonderful review. God bless you and Have a Truly splendid Week! Thank you!…and the same to you and your family. Very creative use of ingredients! The Pineapple-zucchini combo sounds great! I love that you infused pineapple into a zucchini bread recipe. Can’t wait to try this one! We love pineapple in this zucchini bread Lauren. Enjoy!